The Bishop of Manchester is neither a member nor a supporter of the Labour Party. We know this because he tweeted it. He lauds the Guardian for its superior journalism; not its political morality. Any opposition he has to Conservative Party policy on (say) immigration, welfare reform, benefit cheats, right-to-buy, climate change, or nuclear defence is purely coincidental. The fact that he misrepresents Conservative ministers and mocks leading members of Margaret Thatcher’s cabinet while singing the praises of Labour MPs is neither here nor there. The fact that he routinely rails against “Tory cuts” is of no consequence. He finds Jeremy Corbyn fascinating, (or at least re-tweets those who do), but if you think he’s one of the “Bishops on the Left“, you are very much mistaken. No, Bishop David Walker seeks only to express compassion, mercy, justice and peace. His mission is holistic and gospel-grounded; not narrowly partisan or political. He seeks to celebrate our common heritage; not stir up division or foment hate. He is “passionate about issues which affect social housing, asylum seekers and benefit cuts” because Jesus is. And Jesus inclines a bit more toward Labour than the Tories. At least that’s the view of the Dean and Chapter of Manchester Cathedral, who must have consented to hosting the counter-Conservative rally organised by the anti-Conservative Communication Workers Unions with the anti-Tory-cuts ‘People’s Assembly‘. “We are sending a clear message to the Government by taking our campaign to the heart of their key calendar event,” they declared. And Manchester Cathedral was only too happy to facilitate the march of the people against austerity. Indeed, the Dean, the Rev’d Rogers Govender, launched the rally with a prayer and introduced Labour’s messiah “with a smattering of jokes about Mr Corbyn’s initials, JC”. There’s nothing wrong with peaceful protest, of course, but (you have to ask) would the Dean and Chapter of Manchester Cathedral have been content to host a right-wing rally during the Labour Party Conference? 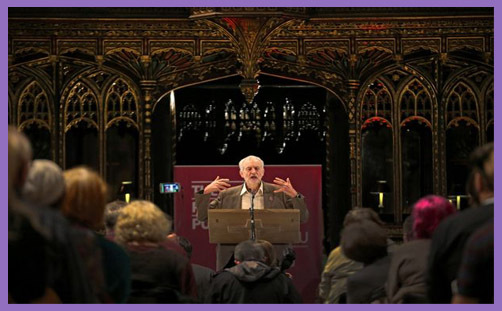 Would they have allowed prominent, robust right-wingers to park their purple tanks on Jeremy Corbyn’s lawn, to detract from his gospel-grounded message of compassion, mercy, justice and peace? Would they have been content for a horde of 17,000 right-wing protesters to flood the parochial nave and besiege the Perpendicular Gothic to rail against the evils of uncontrolled immigration, unaccountable European union, and the burgeoning national debt? Would they have been happy for (say) Nigel Farage to be feted by the rood screen like a rockstar, poisoning the minds of the masses with his right-wing xenophobia, swivel-eyed europhobia and little-Englander closet racism? Would the Bishop of Manchester have been content to watch the right-wing prophets of division and hate offer a right-wing extremist sacrifice on the altar of social diversity? Would the Dean have prayed to inaugurate a Ukip rally and then joke about the need for a St Nigel..? We are a city that celebrates our common heritage of peaceful protest in the name of social progress and justice, gaining strength from the diversity of communities across Greater Manchester. But we must stand together in the true spirit of hope not hate. This is my message to those who intend to whip up intolerance, violence and hatred. They are not welcome in our city which has built its foundations upon respect and tolerance. Whilst I urge people to turn their backs on these people, I recognise those who wish to express their opposition to hatred and intolerance by counter-demonstrating and I urge that this is done peacefully. Quite right, too. Has the Bishop said anything about the intolerance, violence, threats, spitting, assaults and general abuse being hurled at delegates attending the Conservative Party Conference? Or aren’t those haters far left enough?